The Anti-Bullying Week unique Anti Bullying Roadshow for Anti Bullying Week or the Special Creative Anti Bullying Week packages to empower your students are now available for schools to book. 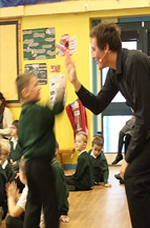 Actionwork® has tours shows and creative workshops on a wide range of topics to primary and secondary schools, colleges, theatres and work places all over the UK and abroad. If you are on your mobile phone click here for our mobile web page. Actionwork® provides INSET and peer support training, conferences, festival and event production, courses, filming projects, resources, counselling, empowerment programmes, confidence building and a wide range of creative educational programmes for adults and young people on all kinds of issues and topics such as health, racism, teenage pregnancy, cyberbullying, homophobia, body image, drug misuse, self-harm, citizenship, relationships, friendships, transitions, PSHE and safeguaring issues. We can tour to your school, venue or workplace to deliver your chosen project, or we also offer in-house activities and projects at our Creative Arts Centre.